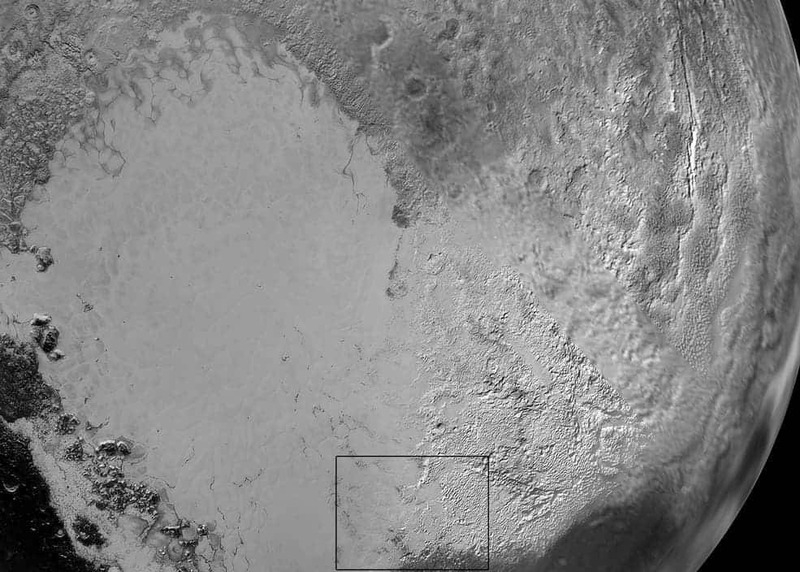 Even more awesome images of Pluto released! 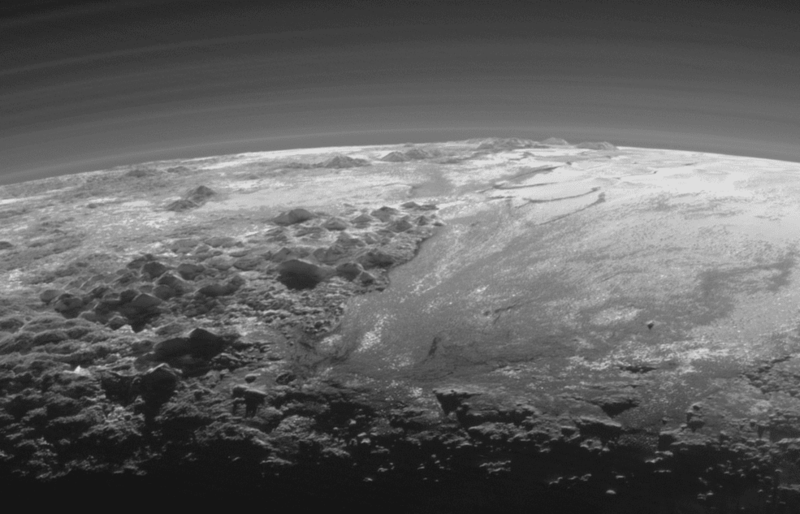 I know, I know, we’ve spoiled you with awesome photos of Pluto already, this couldn’t possibly surprise you, could it? 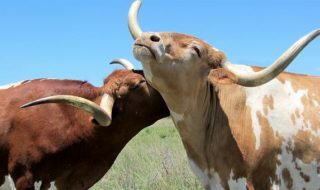 Well, I dare say NASA has done it again – this new batch of New Horizons images is absolutely breathtaking. New Horizons is an interplanetary space probe launched to study Pluto and the outer areas of our solar system. On July 14, 2015 11:49 UTC (07:49 EDT), it flew 12,500 km (7,800 mi) above the surface of Pluto, making it the first human spacecraft to study the small planetoid. It took so many photos and analyzed so much information that NASA will be downloading it for about a year. These oblique images offer an unprecedented look into Pluto’s landscapes, with dramatic backlighting from the Sun. The scene above measures 780 miles (1,250 kilometers) across. It almost looks like taken from a hot air balloon. But it’s not just pretty pictures – New Horizons images offer a trove of valuable information about Pluto. Along with the previous photos, NASA now believe Pluto has an Earth-like hydrological cycle, but one which involves soft and exotic ices like nitrogen, instead of water. Pluto’s ‘Heart’: Sputnik Planum is the informal name of the smooth, light-bulb shaped region on the left of this composite of several New Horizons images of Pluto. 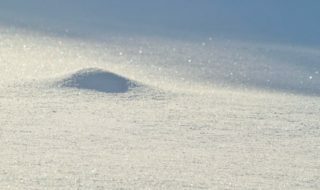 The brilliantly white upland region to the right may be coated by nitrogen ice that has been transported through the atmosphere from the surface of Sputnik Planum, and deposited on these uplands. The box shows the location of the glacier detail images below. 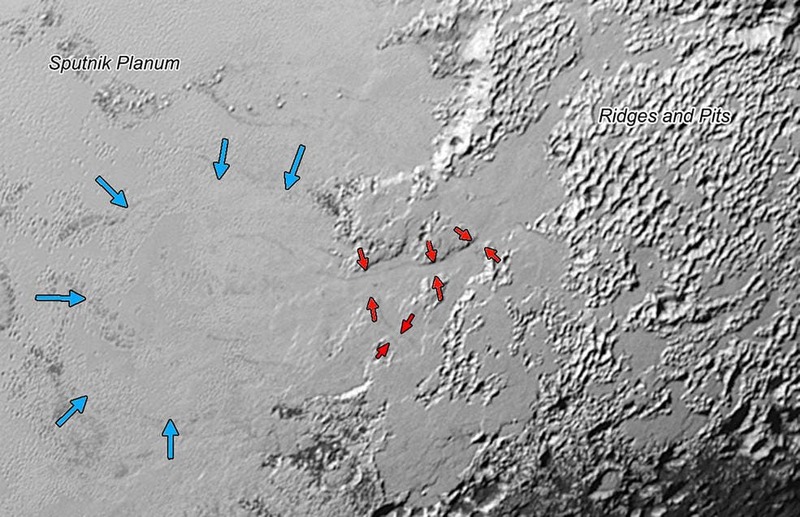 Valley Glaciers on Pluto: Ice (probably frozen nitrogen) that appears to have accumulated on the uplands on the right side of this 390-mile (630-kilometer) wide image is draining from Pluto’s mountains onto the informally named Sputnik Planum through the 2- to 5-mile (3- to 8- kilometer) wide valleys indicated by the red arrows. 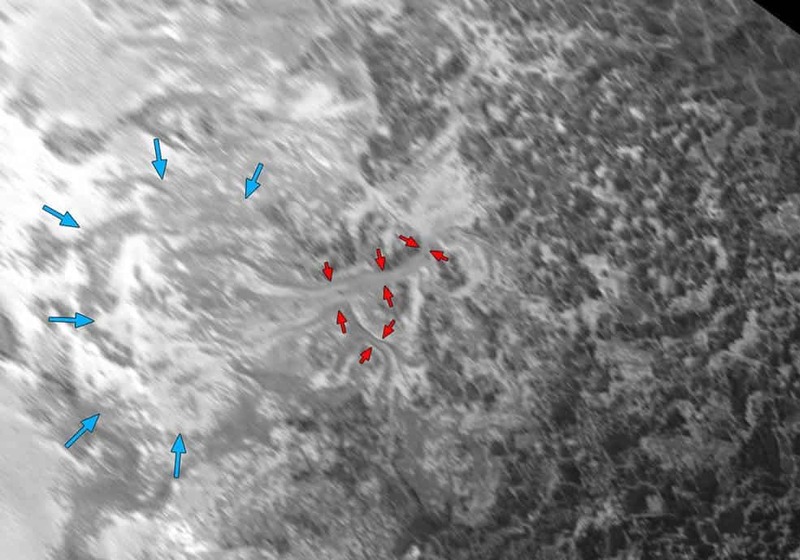 The flow front of the ice moving into Sputnik Planum is outlined by the blue arrows. The origin of the ridges and pits on the right side of the image remains uncertain. 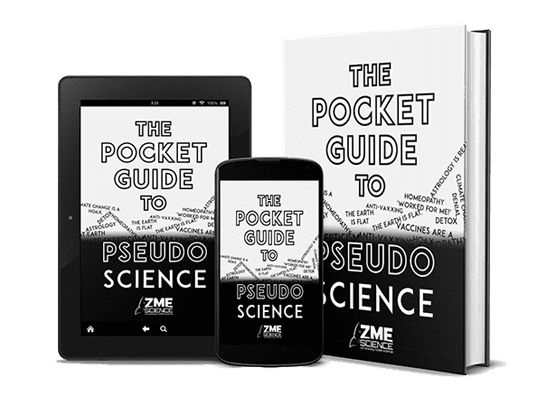 This comes as a surprise because NASA wasn’t expecting to find liquid or frozen nitrogen at all – let alone a hydrological cycle. The next step is to study the photos and determine, from the morphology what kind of geological and erosional features are present on Pluto. They’ve already identified some interesting features. ntricate Valley Glaciers on Pluto: This image covers the same region as the image above, but is re-projected from the oblique, backlit view shown in the new crescent image of Pluto. The backlighting highlights the intricate flow lines on the glaciers. The flow front of the ice moving into the informally named Sputnik Planum is outlined by the blue arrows. The origin of the ridges and pits on the right side of the image remains uncertain. 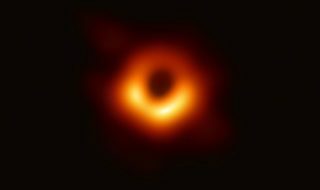 This image is 390 miles (630 kilometers) across.